The Trump Administration affirmed its support for the Army’s Future Vertical Lift (FVL) program with a $790 million FY2020 research and development program funding request last month. 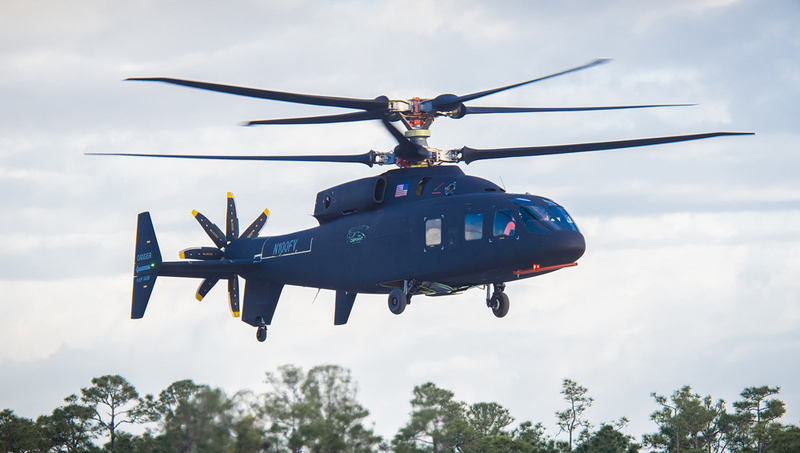 Days later, the Sikorsky-Boeing team announced the SB-1 Defiant compound helicopter had made its first flight on March 21 at Sikorsky’s West Palm Beach test site. The aircraft builds on the technology Sikorsky developed for the X2 and S-97 Raider demonstration aircraft and features two composite coaxial main rotors and an aft propulsor. The 30-minute first flight was devoted to slow speed maneuvers and the propulsor was not engaged. The Defiant’s first flight comes 15 months after its main FVL competitor, Bell’s V-280 third-generation tiltrotor, made its first flight. Both aircraft are designed to show the increased speed and range their respective designs afford compared to traditional rotorcraft. The Defiant’s flight delay was due in part to initial difficulties related to fabricating its rigid main rotor blades. During the delay, the Army appeared to be “slow walking” FVL; having wanted to initiate the technology development phase of the program by mid-FY2019. It now plans to issue a formal FVL request for proposals at the end of FY2021. FVL is part of the Army’s strategy to move away from legacy weapons systems and into the realm of new technology with a variety of weapons due to be fielded starting in 2030. The V-280 has already demonstrated the ability to fly at forward speeds up to 280 knots and is designed to carry a crew of 4 and 15 troops with an effective combat radius of 500 to 800 nm. The SB-1 is designed for a maximum forward speed of 250 knots with a crew of 4 and 12 combat-equipped troops. Both aircraft are designed to meet the Army’s specifications for Vertical Lift Capability Set 3, also known as the Future Long-Range Assault Aircraft (FLRAA), designed to replace the 4,000 UH-60 series Black Hawks currently in the DoD inventory. The Army also plans to hold a future competition for a smaller FVL Set 1, also known as the Future Armed Reconnaissance Aircraft (FARA), designed to be small and nimble enough for urban warfare. Sikorsky already has proposed a smaller variant of the Defiant for that mission, more akin to the footprint of the S-97 Raider. Bell says it has an aircraft in mind for FARA but has yet to reveal it, but it likely could be a fatter version of its proposed unmanned V-247 tiltrotor. Other OEMs are likely to jump into the FARA competition as well, with Airbus saying it will offer its Racer compound helicopter and Leonardo possibly offering an armed AW609. A conventional helicopter would seem hard-pressed to meet the Army’s FARA requirements: a top speed of 205 knots, a combat radius of 135 nm, optionally piloted capability, and manned-unmanned teaming with drones. And the Army wants all this for the same flyaway price of the current Boeing AH-64 Apache, about $30 million per unit, and is looking to have aircraft in flight test by 2023. FARA would be the Army’s fourth attempt to devise a replacement for the Bell OH-58 Kiowa over the last four decades, having abandoned the pricey RAH-66 Comanche program in 2004 after spending $7 billion and building just two prototypes; the less ambitious ARH-70 Arapaho, a military variant of the Bell 407, in 2008 after per unit costs ballooned to $14.5 million; and the Armed Aerial Scout program in 2013, after estimated program costs grew to $16 billion. The competition for the larger, and potentially far more lucrative, FVL Set 3 aircraft will offer a classic match-up between the attributes of helicopter versus a tiltrotor. Defiant proponents point out that it is more maneuverable and has a smaller disk area than the V-280, while advocates for the latter claim it is more survivable, faster, and amply maneuverable for the military’s needs. The Set 3 program could be worth as much as $100 billion to the winner, excluding foreign military sales. Meanwhile, the Army is continuing modernization programs on its legacy helicopter airframes—UH-60, AH-64, and CH-47—designed to keep those models operational possibly until 2060. In February, the Army awarded GE Aviation a $517 million contract to complete development work on the new ITEP (improved turbine engine program) T901-GE-900 engine designed as replacement power on UH-60s and AH-64s beginning in 2025.